Do you have products containing any of these three ingredients on your shelves? If you do, then it’s time for a major clearance. In this week’s blog post, we’re here to talk about the mystery additives that might be added to your hair products, why they aren’t so great and how you can avoid them. The reason why you find them in a lot of hair products is that they act like detergents. They are very effective in the process of removing dirt and oil from the hair and scalp. The problem with sulfates is that they can remove a little too much. In other words, sulfates are aggressive and “harsh” and can strip away your scalp’s natural moisture. Prolonged use of sulfates can weaken your hair cuticles which can have a huge impact on the condition of the hair and its long-term growth. Today it’s not uncommon to see “Paraben free” on lots of product labels, here’s the reason why: parabens are a group of chemicals that are similar to the hormones that naturally occur in the body. Thus, added parabens are harmful because they can disrupt the natural release of these hormones. In many products, parabens act as “fillers” used to swallow the product and create more of the product itself. Thus, they don’t provide any actual value to the quality of the product only the quantity of it. 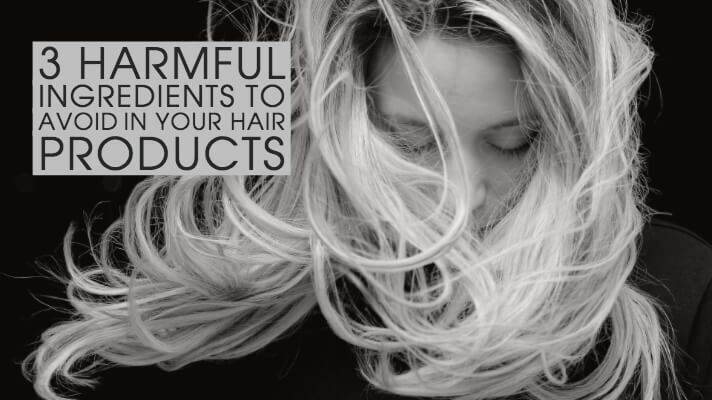 A big no-no when it comes to hair products is silicones. The reason why? They do not dissolve in water which, in the short term, might give the hair extra shine, but in reality, it causes the hair to become dull and dry by blocking essential oils and moisture that penetrates from the hair’s cortex. Also causing your scalp to become way out of balance; a “wall” is built which prevents other products to penetrate the hairs’ strands while also causing unwanted build up, especially for those with curly hair. In addition to sulfates, parabens and silicones, you want to make sure that your hair products don’t contain chemicals that are either too acid or too alkaline. If they do, your hair’s pH-balance could be in disarray. For instance, if your hair has an alkaline pH-balance, the cuticles might be swollen and disappear, which could result in unnecessary swollenness of the cortex as well as damage. In addition, your color might fade quicker as your melanin levels are susceptible to damage. Ideally, your pH-balance should be between 5-5.5. At Fabio Scalia Salons we offer the best high-quality products that focus on the hair’s integrity and long-term growth. Thank you so much for sending this information out. I heard there were products to avoid, but wasn’t sure what they were, except for Parabens. I forwarded this article to all my friends & family. See you the next time I’m in NY.